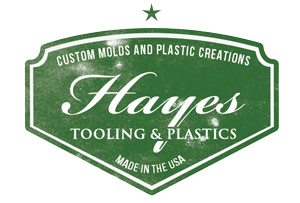 Hayes Tooling and Plastics Inc. is a production facility capable of concept design and production of molds. We also have prototyping capabilities using methods such as 3D printing. We have 4 Plastic Injection Molding machines and 2 Plastic Blow molding machines capable of producing plastic parts from the molds we design or a mold provided by our customers. We also offer warehousing and distribution. Our engineering process begins with a custom design that we mold into a perfect and durable product. We pride ourselves on quality and customer satisfaction and after over 40 years in the business, we have perfected the craft of custom molds and plastic creations. We supply to military retail, camping, and outdoor outfitters. Since we are a small family owned business and produce all of our goods in-house and in the United States, we would love to invite you to make a custom order today. Along with designing custom molds, we can also add personalizion by printing artwork of your choice onto our products. A quality mold is essential to a quality product, therefore we use cutting edge methods to accurately and precisely build our molds. We mass produce our products using manufacturing methods such as Plastic Injection Molding and Plastic Blow Molding. Logistics is important. Not only do we have competitive prices, we ship our products in a timely and efficient manner.